Early Bird is probably trying to cash in on the bird phenomenon that’s swept across the app store, and already seems to be achieving that goal. Since its August release, it’s been downloaded by more than 2 million people, and I imagine that that figure will continue to rise rapidly for quite some time. The main reason is that despite the game being full of content, polish and an entertaining enough mechanic, it’s completely free. The only way that you can lose any money when playing this game is if you purchase an in-app upgrade to the central bird character, making it invincible and allowing you to take as many swipes as you want in a level (more on that soon). Basically, if you want to remove any challenge from the game, you might find yourself spending 99 cents. Not too bad a deal for those that like a challenge. Your aim is to fling a bird towards a target, the hidey-hole of an eyebrow-splattered worm. 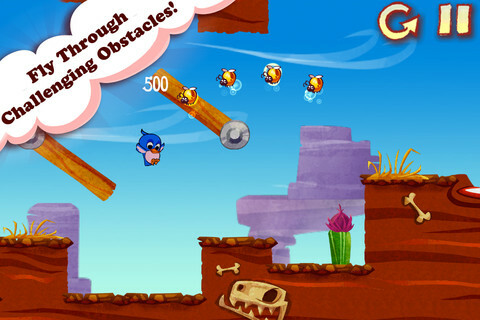 Reach the target without exceeding the maximum number of jumps and the bird will gobble the worm up greedily. The controls are simple and work well – you swipe on the screen in the direction that you want the bird to travel, with the ferociousness of your swipe mirroring the power with which the bird flutters around the stage. The mechanic isn’t original, the charming cartoon graphic style has been used a million times before and the environments in which you play aren’t particularly imaginative; happy countryside, a snowman-filled world of ice, a sun-dried tomato-coloured desert and somewhere in rayman land, near water. But none of that’s a big problem, because at the end of the day, the game’s quite fun. Not overwhelmingly, wet-your-pants-with-excitement enjoyable, but quite fun. There are a few expansions on the basic game mechanic that add longevity to the app. In the ice stages, for example, the bird slides along frosted surfaces. Thorns crawl menacingly along levels, killing the bird upon touch. Trampolines provide an extra bounce towards the target. Such interactive objects keep the game interesting, adding yet more value to the package. I could explore the game in more detail, but honestly, you can probably guess the rest – the app includes a three star rating system, achievements, decent enough background music and more. It’s all there, and all good. Nothing is great, but everything that needs to be, is good. There’s only one mode, which includes 96 levels for you to play through. Overall, Early Bird is nothing unique or special, but is a high quality game that’s free. It’s got enough content to last for a few hours, and enough variety to keep you wanting to play. Check it out – you’ve got nothing to lose.